Another long awaited Air Jordan Retro 5 (V), the Black / Metallic Silver Red, this time containing Michael Jordan’s number stitched on the heel, 23. Lineups all over started for the Air Jordan Retro 5 (V) Black / Metallic Silver Red. 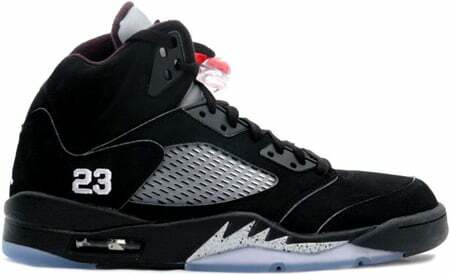 The release date for the Air Jordan 5 (V) Retro Black Metallic Silver Red 23 was January 20th 2007. Retail price is $135, and finding a pair of Air Jordan Retro 5 (V) Black / Metallic Silver – Red 23 for $180 – $200 is not impossible.